SiberKreasi was created to address the threat of negative content through the internet that has been plaguing the country. The Indonesian Government continues to empower the community in facing the challenges of the digital era by carrying out their commitment to improve the quality of the human resources they have in the country. According to a recent press release, one of the said efforts implemented by the Ministry of Communications and Information is digital literacy through the Creative Cyber Movement. Minister of Communications and Information Rudiantara shared that an achievement has been reached by the Creative Cyber ​​Movement Program in 2018. As compared to 2017, the enthusiasm of the community to participate in the activities of the Movement had increased greatly. SiberKreasi, or the Creative Cyber Movement, is Indonesia’s national movement for digital literacy. It was created to overcome the threat of negative content through the Internet in the country. Usually, the threat comes in the form of hoaxes, cyberbullying and online radicalism. According to the Minister, there are approximately 350 locations that have been reached by the digital literacy programs in 2018. As for community involvement, around 125,000 active participants have taken part in their cyber creation workshops. Another milestone achieved by the Movement in 2018 was the increase in number of partners who have joined the government and private institutions, among them were several top artists. The members of SiberKreasi have snowballed from the 20 partners in 2017 to 2018’s, 96. The partners come from different fields such as several government ministries, corporations, universities, non-governmental organisations and public figures like the artists. The Ministry was able to collect data on the total negative content in Indonesia in 2018. According to the data, it reached almost 1 million, with 984,000 sites containing negative content. The have also gathered data on different social media platforms, which have reached a combined total of around 550,000 in negative content. SiberKreasi aims to encourage people to actively participate in spreading positive content through its various programs. The LiterasiDigital.id is a web portal that provides information on digital literacy through different forms of published literature. All the available literature was provided free of charge by the partners involved with the movement. Si-creative Batik is a voluntary and self-reliant initiative of a number of craftsmen to improve digital literacy in the country through arts and culture, particularly Batik. 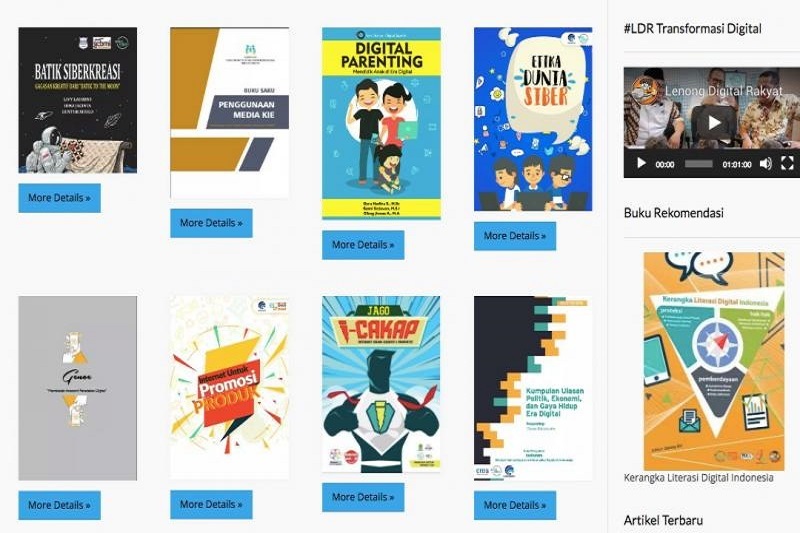 Digital Guide is a program that equips the general public with the understanding, the abilities, and the fundamental competencies in order to support the development of digital literacy in Indonesia. The School of Influencers is the initiative of developing positive content on the Internet. Young Indonesians are encouraged to produce positive content such as videos, images, articles, blogs and vlogs. StopHoax.id is an initiative that allows Indonesians to identify and report fake news or hoax that they have found online. Creators Hang Out is the gathering of content creators and experts in order to share their experiences, views, and knowledge with the young people and the general public.